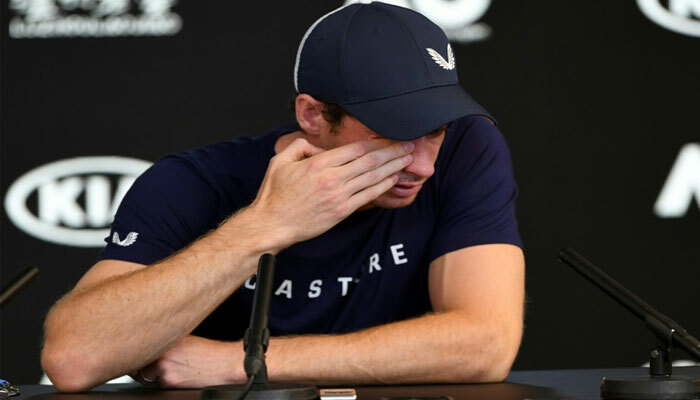 MELBOURNE: A tearful Andy Murray on Friday announced he would likely retire this year due to severe pain from a hip injury, saying next week´s Australian Open could be the last tournament of a glittering career. "I´ve been struggling for a long time. I´m not sure I can play through the pain for another four or five months. "Pretty much done everything that I could to try and get my hip feeling better and it hasn´t helped loads." He pulled out of last year´s Australian Open to have hip surgery and only returned in June at Queen´s Club in London. "I´m going to play. I can still play to a level, not a level I´m happy playing at," he said. One of the so-called Big Four, along with Federer, Djokovic and Nadal, who have dominated the game for years, Murray´s ranking has slumped to 230. He hasn´t reached a Grand Slam final since winning his second Wimbledon title in 2016, but has nevertheless enjoyed a glittering career since turning professional in 2005, with not only three Grand Slam titles, but two Olympic gold medals and 45 ATP crowns. Notably, in 2013 Murray became the first British man to win Wimbledon for 77 years, ending the nation´s obsession with finding a champion to follow in the footsteps of Fred Perry. "When you search for examples of ´emptied the bucket to be as good as they could be´ there should be a picture of Andy Murray sitting under that quote," he tweeted. "That´s something I´m seriously considering right now," he said.